Interferon-y (IFN-y) is a pleotropic cytokine that induces antiviral, antiproliferative, and immunomodulatory effects on numerous target cells . These diverse biological activities are initiated by IFN-y-mediated aggregation of at least two different cell surface receptors: IFN-yR1 and IFN-yR2. X-ray crystallographic studies of IFN-y and its receptors have been undertaken to delineate the molecular architecture of the receptor complexes and to understand the detailed recognition mechanisms that are ultimately responsible for IFN-y biological responses. Here, these structures are summarized in the context of current biochemical and bioactivity data. Natural forms of human IFN-y are comprised of two 143-amino-acid peptide chains that are posttranslationally modified to contain an N-terminal pyroglutamic acid residue, N-linked glycosylation at two positions, and a heterogeneous C terminus containing the positively charged sequence KTGKRKR (residues 125-131). The crystal structure of human IFN-y has revealed the tight association of two peptide chains (comprised of six a-helices, labeled A to F, from the N to C terminus) into a remarkable intertwined helix topology to form a symmetric dimer (Fig. 1) . As a result, the two-fold related domains of IFN-y are formed from the first four helices of one chain (A-D) and the last two helices (E' and F') from the other. Despite almost no sequence identity, the identical intertwined topology is also observed in the crystal structure of IL-10 . The a-helices that form each domain are 9 to 21 residues long and are essentially linear (with the exception of helix F, which displays an « 50° bend). The helices are connected by short loops of 3 to 5 residues, except for the 13-residue AB loop that encircles helix F. C-terminal residues 124 to 143 extend away from the core of the molecule and are presumed to be flexible. IFN-yR1 and IFN-yR2 are both type I membrane proteins that contain extracellular and cytoplasmic domains connected by a hydrophobic membrane spanning helix. The extracellular domain of IFN-yR1 binds IFN-y with high affinity («1 nM), while IFN-yR2 exhibits essentially no affinity for IFN-y. Coexpression of IFN-yR1 and IFN-yR2 on cells results in a fourfold increase in affinity for IFN-y compared to cells expressing IFN-yR1 alone, suggesting that the IFN-yR2 binding site is formed from residues on IFN-y and IFN-yR1 as presented in the IFN-y/IFN-yR1 complex. IFN-y-induced formation of the biologically active complex of IFN-y, IFN-yR1, and IFN-yR2 activates the Janus kinases (JAK1 and JAK2) that are associated with the cytoplasmic domains. JAK-dependent phosphorylation of the intracellular domain of IFN-yR1 results in the recruitment of the nuclear transcription factor STAT1 and subsequent expression of IFN-y-inducible genes . At this time, structural information is only available for the extracellular domain of IFN-yR1 (sIFN-yR1) as it exists in complex with IFN-y (Fig. 1) [4-6]. Based on this work, sIFN-yR1 is comprised of two fibronectin type III domains (FnIII). The FnIII modules consist of a sandwich of two antiparallel P-sheets made up of seven P-strands: A, B, E, G, F, C, and C'. 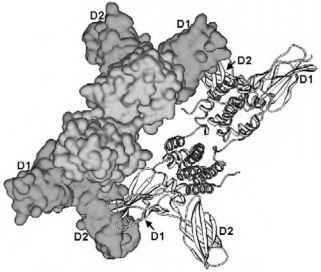 The N-terminal domain (D1) and the membrane-proximal or C-terminal domain (D2) are oriented at «120° to one another. 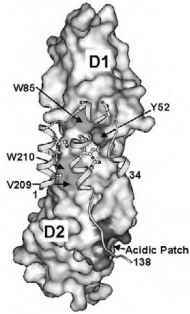 The IFN-y binding site is located at the crevice between D1 and D2. Receptor residues that contact IFN-y are located on five different segments (labeled L2 to L6) that correspond to CC' and EF loops of D1, the domain linker, and BC and FG loops in D2. 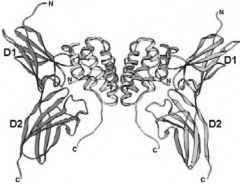 Figure 1 Ribbon diagram of the IFN-y/IFN-yR1 receptor complex. The putative position of the cell membrane is at the bottom of the figure. The N and C termini of each molecule are labeled, as well as the D1 and D2 domains of the receptor. Figure 2 The IFN-y/IFN-yR1 interface. IFN-yR1 is shown as a molecular surface while IFN-y segments (residues 1-34 and 108-138) that bind IFN-yR1 are represented by a yellow ribbon. Several IFN-yR1 residues that participating in important interactions in the interface are labeled by arrows. The sidechains of IFN-y residues Val-5, Glu-9, Arg-12, Ser-20, Asp-24, His-111, Glu-112, and Gln-115 are shown. The acidic patch located on IFN-yR1 is labeled, and the predicted interaction with a modeled C terminus of IFN-y is shown. symmetric binding of two IFN-yR1s to one IFN-y dimer (Fig. 1). The two receptors in the complex do not interact with one another and are separated by about 100 A at the putative position of the cell membrane. The large distance between the IFN-yR1s is consistent with the 1:2 complex being an intermediate that is dependent on IFN-yR2 binding and JAK2 recruitment to initiate the phosphorylation cascade. The two-fold symmetry of the IFN-y/IFN-yR1 complex suggests that it contains two binding sites for IFN-yR2. Figure 3 Crystal structure of the 2:4 IL-10/IL-10R1 complex . The view is looking down the two-fold axis of IL-10. The 1:2 IL-10/IL-10R1 complex represented by molecular surfaces is very similar to the IFN-y/IFN-yR1 complex shown in Fig. 1. The predicted positions of the IL-10R2s are shown as ribbons. The D1 and D2 domains for each receptor are labeled. This structure provides a possible model for the biologically active IFN-y/IFN-yR1/IFN-yR2 complex. other (Fig. 2). These residues form a continuous binding site that includes helix A, the AB loop, and helix B from one chain and helix F from the other. More recently, a 2-A structure of a mutant IFN-y/IFN-yR1 complex has revealed additional details of the binding site, including the participation of five ordered waters in the interface and the reassignment of IFN-yR1 Val-206 to an unfavorable phi-psi value to optimize its interactions with IFN-y . In all free and bound structures reported to date, the C terminus of IFN-y that is important for binding and biological activity has not been observed; however, an acidic patch was identified on the receptor that may provide a "Velcro-like" interaction site for the basic C terminus of IFN-y . Limited sequence identity confirms that IFN-yR2 is structurally similar to IFN-yR1; however, the inter-domain angle, receptor binding loops, and binding site cannot be accurately predicted. Currently, the most intriguing model for IFN-yR2 binding has been proposed from the analysis of the crystal structure of the IL-10/IL-10R1 complex . In solution and the crystals, IL-10 and soluble IL-10R1 form a complex consisting of 2 IL-10 dimers and 4 IL-10R1s (Fig. 3). Structure and sequence comparisons of IL-10 and IFN-y receptors suggest that high-affinity (IL-10R1 and IFN-yR1) and low-affinity (IL-10R2 and IFN-yR2) receptors may share a common binding site on their respective cytokines. The 2:4 IL-10 receptor complex suggests a model for how the low-affinity IFN-yR2 may simultaneously interact with IFN-y and IFN-yRL This structural model is supported by limited homolog scanning on IFN-yR1 and radiation inactivation data showing that IFN-y biological activity requires two IFN-y dimers . Confirmation of this model will require the structure determination of the IFN-y/IFN-yR1/IFN-yR2 complex. 1. Bach, E. A., Aguet, M., and Schreiber, R. D. (1997). 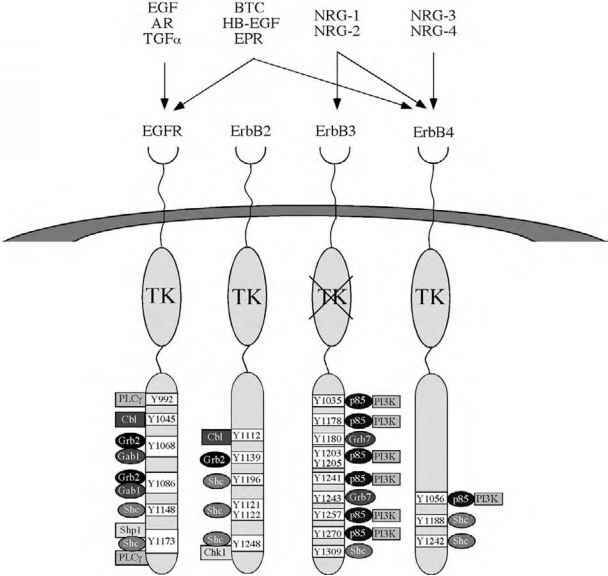 The IFN-gamma receptor: a paradigm for cytokine receptor signaling. Annu. Rev. Immunol. 15, 563-591. 2. Ealick, S. E., Cook, W. J., Vijay-Kumar, S., Carson, M., Nagabhushan, T. L., Trotta, P. P., Bugg, C. E. (1991). Three-dimensional structure of recombinant human interferon-gamma. Science 252, 698-702. 3. Walter, M. R. (1997). Structural biology of cytokines, their receptors, and signaling complexes, in Blalock, J. E., Ed., Chemical ImmunologyNeuroimmunoendrocrinology, pp. 76-98. Karger, Basel. 4. Walter, M. R., Windsor, W. T., Nagabhushan, T. L., Lundell, D. J., Lunn, C. A., Zauodny, P. J., and Narula, S. K. (1995). Crystal structure of a complex between interferon-gamma and its soluble high-affinity receptor. Nature 376, 230-235. 5. Thiel, D. J., le Du, M. H., Walter, R. L., D'Arcy, A., Chene, C., Fountoulakis, M., Garotta, G., Winkler, F. K., and Ealick, S. E. (2000). Observation of an unexpected third receptor molecule in the crystal structure of human interferon-gamma receptor complex. Struct. Fold Des. 8, 927-936. 6. Randal, M. and Kossiakoff, A. A. (2001). The structure and activity of a monomeric interferon-gamma: alpha-chain receptor signaling complex. Structure 9, 155-163. 7. 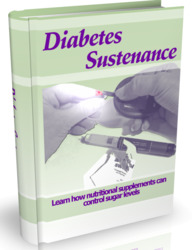 Josephson, K., Logsdon, N. J., and Walter, M. R. (2001). Crystal structure of the IL-10/IL-10R1 complex reveals a shared receptor binding site. Immunity 14, 35-46.